Breakfast in my house does not usually consist of what you’d think of as “normal” foods. We usually don’t eat eggs, we usually don’t eat dairy, and we rarely have time enough to warm up anything. So, sometimes it’s sausage and sometimes it’s a bowl of rice. 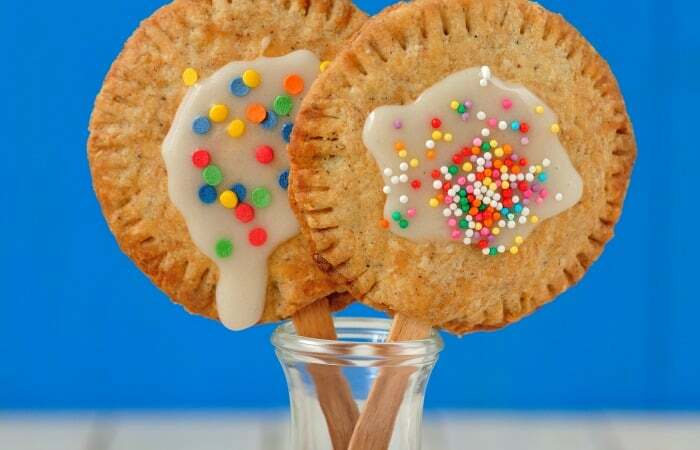 But I came up with this awesome treat for the kiddos this morning. 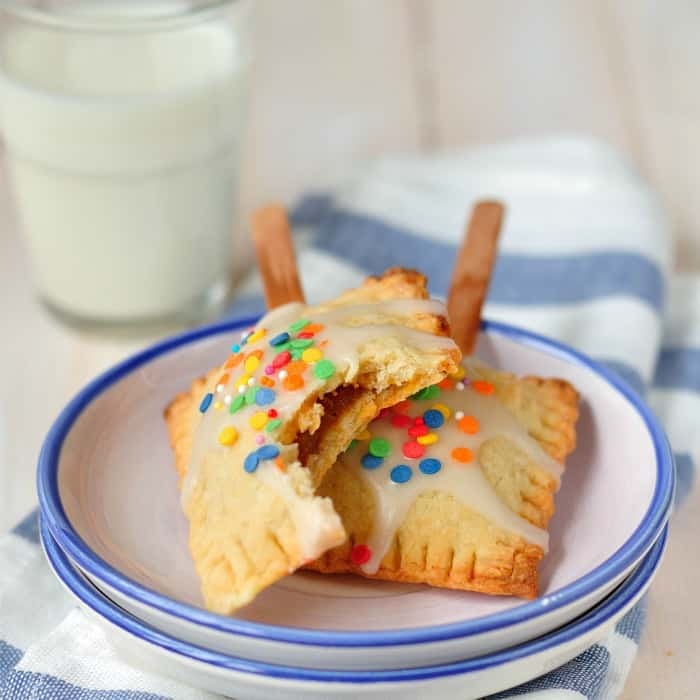 Easy Breakfast Tart Pies…like homemade pop tarts, but without the trip to the store (or the dairy…). YUM! Using a rolling pin and a flat surface, such as a cutting board, flatten each of the pieces of bread as thin as you possibly can. With a large cookie cutter (or a cup turned upside-down, which is what I did), cut off the crusts. Or, just be lazy, like I got toward the end, and cut the crust off and make rectangles. It’s that easy. Place one cut-out of bread on a flat surface, then place 1 tblspn of jelly in the center of the cut-out. Strategically place your popsicle stick with at least 1-inch of stick inside the bread cut-out. Put a correspondingly-sized cut-out on top of the jelly-topped bread cut-out. Repeat with all other pieces of bread. 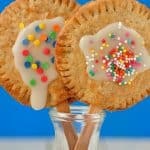 Sprinkle with a bit of granulated sugar, if desired (I didn’t do this because I thought they’d be sweet enough–but I can see where kids might want you to do this, because they really like sugar). In a medium bowl mix coconut milk and powdered sugar until thoroughly combined. Place a dollop of the powdered sugar/coconut milk mixture on each pie. Sprinkle with (you guessed it) the sprinkles. Place in the oven for approximately 10-12 minutes or until golden brown. Remove from oven and allow to cool for about 5 minutes or until they won’t burn your mouth like a volcano-cooked-lava-pocket-of-ouch. 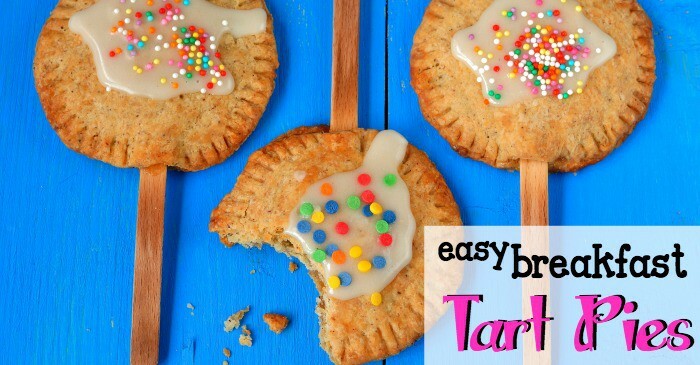 Easy Breakfast Tart Pies...like homemade pop tarts, but without the trip to the store (or the dairy...). YUM!